Alright, I know, mirror shot. Not the most professional, but I don't care. I'm not a professional model, with lighting and photographers ever ready, so I use mirrors sometimes. Plus I think their funny. It's hard to pose and make sure your not making a stupid face. Anyway, this top is one of my favorites! I bought it from Hot Topic a long time ago. It's my go to top when I'm trying to lose weight because it helps hide a little. My in-laws let me borrow their P90x, so we will see what happens. I need to lose about 23 pounds to be at a healthy weight...and that's my goal. I want to be healthy, not skinny. 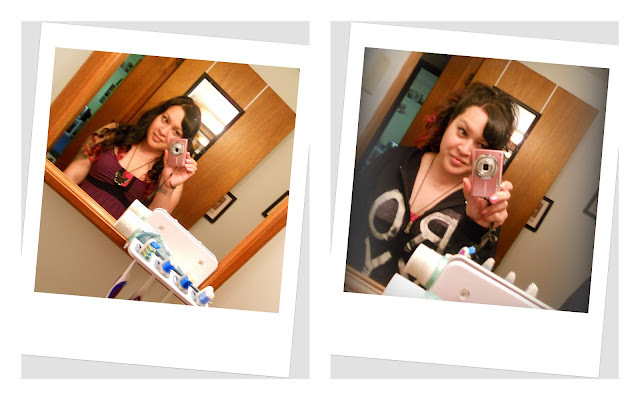 If your wondering, I took these pictures in my bathroom. You can't tell in the picture, but my bathroom is pretty antique looking with it's baby blue accents and old wood. I love it! I finally re-touched my pink. I get a lot of compliments on my hair, the only problem with pinks and reds, is that they fade so fast! I try skipping days of shampooing, but I have healthy hair so it gets oily fast. Same day..started out hair down...humidity hit...and hair went up. I'm also using my old Nikon Coolpix again. the battery is rechargeable and its low maintenance and easy to take me with me everywhere. It can fit into the pocket of that Roxy jacket I'm wearing, which I bought last year on my honeymoon cruise. I can't believe our 1 year anniversary is in 2 weeks! Well I hope you enjoy my totally un-professional pictures!